2. miRNA and Cancer: A Deadly Liaison? Cancer and Noncoding RNAs offers an in-depth exploration of noncoding RNAs and their role in epigenetic regulation of complex human disease, most notably cancer. 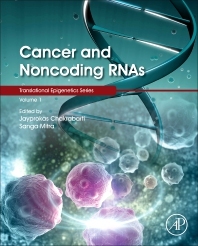 In addition to examining microRNAs, this volume provides a unique evaluation of more recently profiled noncoding RNAs now implicated in carcinogenesis, including lncRNAs, piRNAs, circRNAs, and tRNAs, identifying differences in function between these noncoding RNAs and how they interact with the rest of the epigenome. A broad range of chapters from experts in the field detail epigenetic regulation of various cancer types, along with recent next generation sequencing technologies, genome-wide association studies (GWAS) and bioinformatics approaches. This book will help researchers in genomic medicine and cancer biology better understand the role of noncoding RNAs in epigenetics, aiding in the development of useful biomarkers for diagnosis, prognosis and new RNA-based disease therapies. Dr. Chakrabarti earned his PhD from the City University of New York. He conducted postdoctoral training at University of Rochester, New York; the Institute of Theoretical Science in Eugene, Oregon; and the University of Bielefeld, Germany. Currently he is a Senior Lecturer at the Indian Association for the Cultivation of Science (IACS) in Kolkata, India and a Principle Investigator at Gyanxet-Beta, a commercial lab which develops tools and resources for RNA bioinformatics. Dr. Chakrabarti’s research areas include the role of noncoding RNAs in human disease, specifically in viral infections and head and neck cancer, as well as stem cells and pluripotency and the development of bioinformatics tools for analyzing noncoding RNAs. He has more than fifteen years of research experience in epigenetics, focusing on noncoding RNAs, and more than twenty-five years teaching experience at IACS. In addition to his teaching and research, Dr. Chakrabarti has published more than fifty scientific papers in peer reviewed journals and has served on the editorial boards of Scientific Reports, Bioinformatics, Journal of Biomolecular Structure and Dynamics, Nucleic Acids Research, DNA Research, Human Mutations, PLOS Computational Biology, and BMC Genomics. His lab at IACS has collaborated on epigenetic research with labs at the Massachusetts Institute of Technology, University of Georgia, Stanford University, and the University of Bielefeld, among others. Since 2010 Sanga Mitra has served as a Senior Research Fellow at the Indian Association for the Cultivation of Science (IACS) in Kolkata, India, under the mentorship of her PhD advisor, Jayprokas Chakrabarti. Her research areas within the Computational Biology group at IACS include microarray and RNA-Sequencing data analysis, histone modifications, head and neck cancer, and tRNA gene annotation. She holds an M.S. in Bioinformatics and has recently submitted her PhD dissertation, “Computational Genomics and miRNomics of Cancer.” Sanga Mitra has also presented on her research at genomics, cancer, and bioinformatics conferences around the world, most notably at BIT’s 3rd World DNA and Genome Day, New Horizons in Cancer Research, and the International Conference on Stem Cells and Cancer. She has published eight scientific papers to-date in peer reviewed journals including RNA and Transcription, Journal of Biomolecular Structure and Dynamics, Scientific Reports, Genomic Medicine, and Cancer Biomarkers. Trygve Tollefsbol is a Professor of Biology and a Senior Scientist in the Comprehensive Center for Healthy Aging, the Comprehensive Cancer Center, the Nutrition Obesity Research Center, and the Comprehensive Diabetes Center at the University of Alabama at Birmingham (UAB). He is Director of the UAB Cell Senescence Culture Facility which he established in 1999. Dr. Tollefsbol has doctorate degrees in molecular biology and osteopathic medicine and has edited and co-authored numerous books on the topics of epigenetics, cancer and aging and is Series Editor of Translational Epigenetics. Dr. Tollefsbol is a Professor of Biology and a Senior Scientist in the Center for Aging, Comprehensive Cancer Center, Nutrition Obesity Research Center, and the Comprehensive Diabetes Center at the University of Alabama at Birmingham (UAB). He is Director of the UAB Cell Senescence Culture Facility which he established in 1999 and a Steering Committee Member of the UAB Center for Aging. Dr. Tollefsbol trained as a Postdoctoral Fellow and Assistant Research Professor with members of the National Academy of Science at Duke University and the University of North Carolina. He earned doctorates in molecular biology and osteopathic medicine from the University of North Texas Health Sciences Center and his bachelor’s degree in Biology from the University of Houston. He has received prior funding from the NIA, NCI, NHLBI, NIMH and other federal institutes as well as the Glenn Foundation for Medical Research, Susan G. Komen for the Cure, the American Federation for Aging Research (AFAR), and the American Institute for Cancer Research (AICR) among many other sources. The Glenn Foundation for Medical Research funding was unsolicited and was awarded to Dr. Tollefsbol for lifetime contributions to the field of aging. In 2006 Dr. Tollefsbol was selected and highlighted as part of the 25th anniversary of the AFAR for significant contributions to aging research. Dr. Tollefsbol’s research interests have covered a wide range of topics such as aging, epigenetics, nutrition, cancer, telomerase, and caloric restriction. Work from his laboratory has been featured in Women’s Health magazine, Shape magazine, and the AICR Newsletter and Dr. Tollefsbol has been a Scientist in the Spotlight in ScienceNow. Currently he serves as an Associate Editor for Frontiers in Epigenomics and is on the Editorial Boards of the international journals Open Longevity Science, Epigenetics of Diabetes and Obesity, Molecular Biotechnology and Clinical Epigenetics. He is also a contributing Editor of Lewin’s GENES X classic textbook. Over 25 of the publications from Dr. Tollefsbol’s laboratory have received national or international accolades such as best paper award, selection for press release by the journal editors and featured on the journal homepage. Dr. Tollefsbol has been invited to give presentations on his research in many countries including Germany, China, Italy, Switzerland, France and The Netherlands as well as at various leading institutions in the US such as Harvard Medical School, Tufts University and the University of California at San Francisco. His research has received considerable media attention both nationally and internationally through television, newspaper and radio venues and has been highlighted in eScience News and ScienceDaily. He has ten books which have been published or are in progress and a recent book on “Epigenetics of Aging” that Dr. Tollefsbol co-authored and edited was highlighted in Nature.